In a medium saucepan, combine 2 cups of the sugar with the warm water and bring to a boil, stirring to dissolve the sugar. Remove the saucepan from the heat, stir in the 1/2 cup of coarsely cracked black pepper and let cool. Cover with plastic and refrigerate for 3 hours. 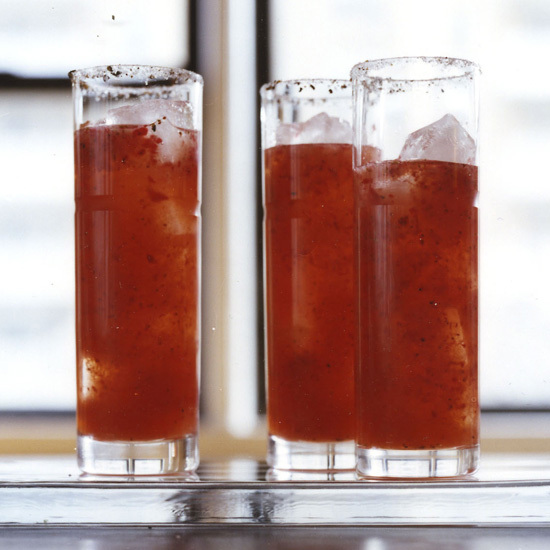 Pour the black pepper syrup through a fine-mesh strainer into a large measuring cup. In a large pitcher, muddle the halved strawberries. Add 2 1/4 cups of the black pepper syrup, the tequila and fresh lime juice (reserve the remaining black pepper syrup for another cocktail). Refrigerate until chilled, about 1 hour. On a small plate, mix the remaining 1/4 cup of sugar with the finely ground black pepper and the salt. Moisten half of the outer rims of 10 rocks glasses with the lemon wedge and coat lightly with the pepper-and-salt mixture. Fill the rocks glasses with ice. Stir the drink well, then pour or strain into the prepared rocks glasses and serve at once. Review Body: What a unique approach to tequila drinks! I didn't have strawberries, so I tried it with mango instead. Bueno! I think the key is black pepper goes really well with tequila!